Report for duty! | L. G. William Chapman, B.A., LL.B. It was 10:30 a.m. this morning, about an hour later than usual, that we climbed onto our bikes and headed out of the residential enclave for our routine daily ride. The sun shone brilliantly. The temperature was already warm and we were clad in T-shirts and shorts only. We set sail for Beach Club (about twenty-five minutes away) to investigate the condition of the beach and to check the direction of the wind. Having arrived there and having discovered no impediment to beach travel, we weren’t a tenth of a mile along the beach when we reluctantly decided to return to the nearby bike shop while it was yet within range to swap one of the bikes which was making unbecoming mechanical sounds. We met with Andrew at the bike shop. He is getting to know us because he not only arranged the relocation of our bikes to our new digs but also recently delivered a replacement bike along William Hilton Parkway when we had a flat tyre. That duty accomplished, it was back to Beach Club whence we began our ritual journey in earnest. The tide had receded substantially at that time of the day so there was a broad swath of dried sand upon which to travel without having to concern one’s self with on-coming traffic (a situation which altered three and one-half hours later upon our return trip and even prompted one officious walker to observe aloud that there was a prohibition against bicycles at high tide). The sun was warm upon us and the sea glistened. There was the faintest haze wrought by the rising temperatures. Our first pit stop was as always Coligny Park where we rested on a bench, gawked at the tourists coming and going and chatted with a woman (whose little dog was the initial go-between) from Michigan. She had recently secured employment here and moved as a result. She apparently shared our abhorrence of winter. Before abandoning our perch we checked our respective email accounts and voided our bladders. 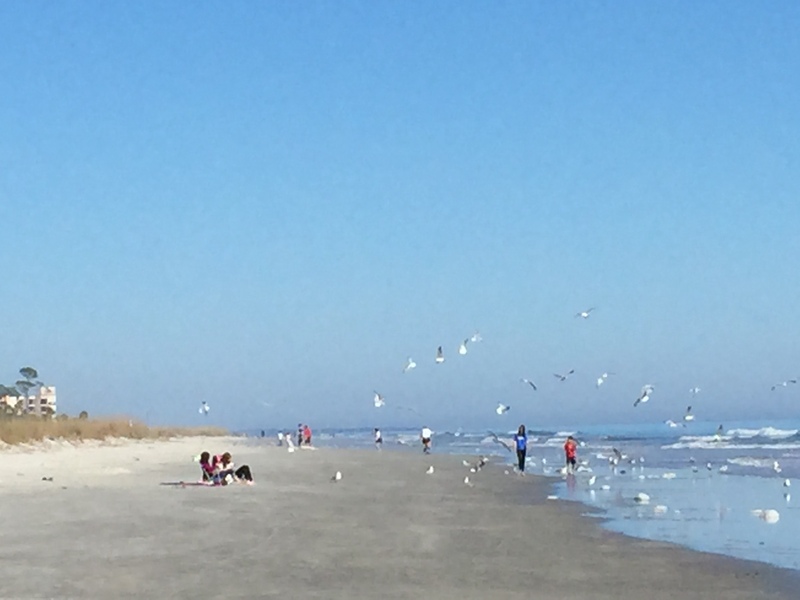 We cycled leisurely from Coligny Park to Marker 97 which interrupts the beach with an inlet bound by rocks. The narrow inlet is too broad to traverse to the other side. Our starting point at Beach Club was approximately Marker 47. The markers are set every tenth of a mile. Here we rested for quite some time as we were both beginning to feel the consequences of our effort. We retraced our previous route (darting between beach goers and cyclists) and landed at home almost four hours after we began. I visited the pool and lounged in the setting sun for another hour. I am glowing now! This bicycle routine is unquestionably the predominant feature of our day. I hesitate to flatter myself for my industry as there are many people my age or more who do the same thing. It is also difficult to argue against this habitual behaviour. The beach experience is different every day notwithstanding the repeated visits. I adore the colours at the beach. The exercise oddly diminishes our standard appetite and we have therefore adopted a further routine of taking our midday meal at a later hour and making it more substantial.